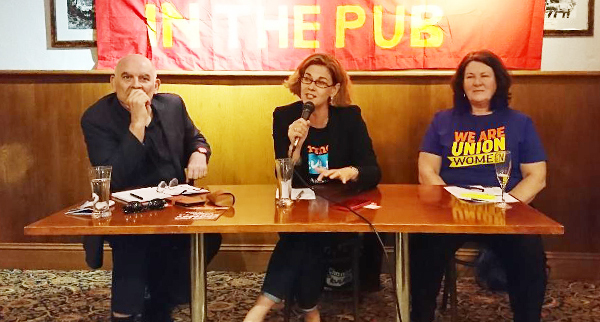 On Thursday April 5, Politics in the Pub in Perth held its second evening on the topic of wage stagnation in Australia. The event was chaired by Dr Christopher Crouch from the CPA (WA Branch) who introduced the topic by defining what a living wage meant to the working class. “We need economic security and a living wage that incorporates social relationships.” This was not occurring in today’s workplace landscape as too many workers do not have sufficient income to buy more than the essentials of life and have access to resources of the state such as health, education and quality affordable housing. The first speaker, Meredith Hammat, secretary of Unions WA opened by observing that Australia was currently experiencing record low wage growth which last year had shrunk to an annual average increase of just two percent. Some employees have had no increase in the last two or three years. Meanwhile the top end of town is not doing it tough with high levels of productivity and profit growth. It has become so obvious said Hammat, that the Business Council of Australia CEO, Jennifer Westacott, recently remarked that she wants workers to have more money through wage rises. However, like the Morrison government, she would prefer to see this done through small cuts in taxes rather than the bosses sharing more of their wealth with the workers. For their part, Hammat noted, the “federal Liberal government of Prime Minister Scott Morrison has not done anything to help workers – in fact the opposite has occurred as they have tried to justify cutting penalty rates.” Most Australian workers are now on insecure work contracts and cannot imagine what permanent full-time employment feels like – even many people in their 30s and 40s who are on casual and fixed term contracts. Labour hire is also used by the bosses to deny workers better pay and conditions and keep workers fearful and submissive hoping for ongoing work. Employers also cancel or threaten to cancel Enterprise Bargaining Agreements and moving workers backwards onto inferior award wages and conditions as they tried on at Griffin Coal, Carlton United Brewery, Murdoch University and Alcoa in Western Australia – but in each of those cases it was the unity and solidarity of the trade union movement which pushed them back. Hammat also called for multi-employer bargaining with unions which is available in other countries – and the bosses shouldn’t be allowed to, “lawyer up” to screw the workers out of their wages and entitlements. Briant said that as workers became discouraged they often sought meaning in life in other ways – in non-material ways such as social media and internet gaming where rewards could often be immediate and tangible. It was therefore important that members were encouraged to seek solidarity and strength in their material conditions as this would ultimately be the only way that a more empowered, meaningful and rewarding existence could be achieved. Briant said that it was necessary to rescue the social contract which the individual has with society, as currently we give away too much and get too little back from the state or sovereign. Briant said that ultimately this is what in many ways the ACTU’s Change the Rules Campaign is all about – taking back the power in the class struggle that in recent years has through successive Liberal and Labor governments gone too much to the benefit of the bosses. The Communist Party of Australia calls on all workers to support the ACTU’s Change the Rules campaign and attend the rallies around the nation on April 10. Next month make May Day the biggest. Vote the Liberal government out and then if Labor win – to keep the pressure on the new government to lift real wages and repeal anti-union legislation. However, when that doesn’t work, remember the words of, The Internationale, the hymn of the working class, change will not come from above.